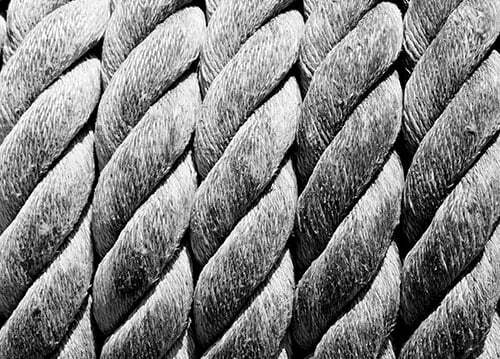 Used for lifting and rigging, fibre rope quickly meets the needs for different lift types. Fibre rope can be used as slings for hoisting loads, taglines for guiding and hard lines for light loads. All About Lifting & Safety provides you with a variety of different size and strength fibre ropes to meet your needs. As fibre rope can be used in many different situations, there is no specific work load limit (WLL) for each product – it all depends how you are using it. Contact the experts at All About Lifting & Safety to get help on how to calculate the WLL for your lift. The weave and material of fibre rope allows it often match the strength of wire rope. In addition to strength, the durability and strength retention of fibre rope over time has increased, which provides you and your team a safe lift experience time and time again. Fibre rope is also less expensive than traditional wire rope, decreasing your expenses and improving productivity. Save time and money by using fibre rope on your jobsite. Using knots in your rope can reduce the strength of the rope by up to 50%. Only use knots when required and always make sure unused knots are untied. Heat can negatively affect fibre rope, so store your rope out of direct sunlight and on hot days be aware how long your rope has been in use. Your fibre rope will remember when it has been used beyond it’s work load limit. Always inspect your ropes before and after use to ensure there is no damage. Not sure how to inspect your ropes? Call our safety experts to learn the ropes! All About Lifting & Safety, your safety equipment experts, have all of your fibre rope, lifting chain, and slings needs covered. Check out our products and services offered to keep your jobsite and equipment operating safely at all times.